Probate is a court-monitored process occurring after an individual has passed away. Probate can take months, or even years, to complete and may involve claims from creditors, possible objections to the will and costly court proceedings. Many states maintain a procedure for executors of small estates whereby the entire probate process is avoided and the estate passes quickly to beneficiaries and heirs. The definition of a small estate is provided by state statute. Most states maintain a small estate threshold of around $25,000, although some states allow small estate administration for estates worth up to $150,000. There are a number of exclusions that do not count toward the total estate value. These exclusions may include the value of the statutory spousal share, exempt property or a homestead allowance. To qualify for small estate status, the executor or personal representative must submit a small estate affidavit. This document attests that the market value of the estate at the time of death does not exceed the small estate threshold. If necessary, the executor may need to have property appraised in order to determine its fair market value. The affidavit also must include the identification of beneficiaries, information relating to the decedent's death, funeral expenses as well as any outstanding debts. In a regular estate administration, creditors have a number of months within which to make a claim against the estate. In a small estate administration, the creditor claims period may be much shorter. Most states require the executor to wait at least 30 days following the decedent's death before filing the small estate affidavit. Some states allow for the distribution of property immediately following the filing of the affidavit while others require the executor to wait the statutory creditor claims period before distributing property. Once the creditor claims period has passed, the executor may distribute the property to beneficiaries and heirs. Typically, there is no involvement by a probate court in a small estate administration and the process moves much more quickly than the regular estate administration process. If the decedent had a will, the executor must follow the provisions of the will when dividing land and personal property. 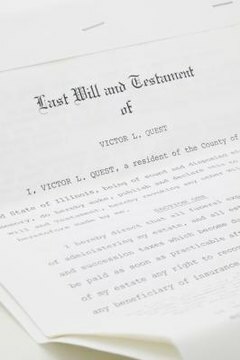 If the decedent did not have a will, the property is divided according to the state laws of intestacy. Reid, Stephanie. "Avoiding Probate & Closing a Small Estate." , https://legalbeagle.com/12298363-avoiding-probate-closing-small-estate.html. Accessed 19 April 2019.